Spiti is fascinating in so many ways that it is difficult not to get bewitched by one of its myriad spells. Beauty comes in several avatars here. It can be in the form of the last silken rays of the soft sun illuminating a lofty mountain peak, a nimble footed Ibex feeding comfortably in a treacherous terrain or a Buddhist prayer flag fluttering in the wind. 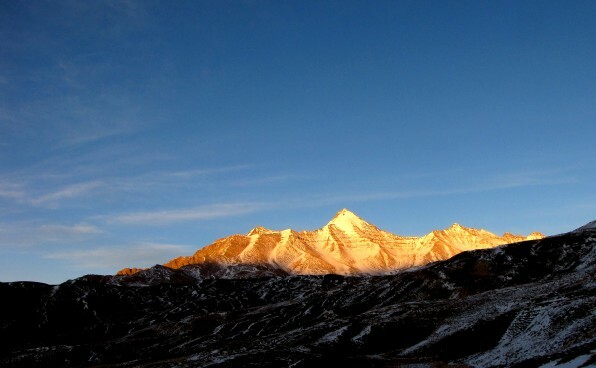 Fading rays of sun illuminate a mountain peak: one of the several spells of Spiti. Its a landscape where the elusive snow leopards and pervasive humans share the same terrain, their fate intertwined in a tangled complexity. My curiosity to know more about snow leopards brought me here, but it was the bewitching landscape that left me breathless; literally!!! At times when fieldwork starts taking a toll on your body and mind, its one of the spells of the magical Spiti that alleviates the spirits. 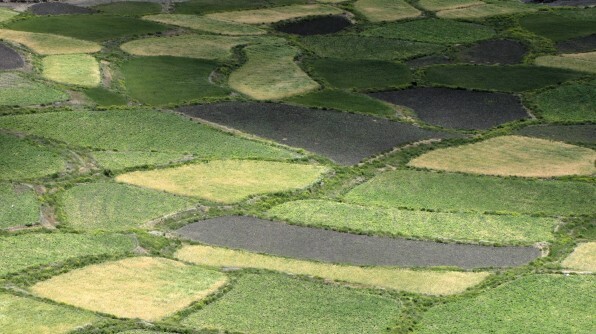 A maze of agricultural fields. The austere landscape is shared by wildlife and people. It had been a busy month and our team had been moving about in the mountains, rushing from one point to another to place camera traps at various locations. It had become a routine work and monotony had quietly crept in. During one of these routine rush through’s, I was visiting the Badang nullah; an excellent snow leopard area. A few years back, Charu and Sushil had watched a snow leopard at this very nullah for more than an hour, resting quietly underneath one of the cliffs. The approach however was quite difficult and it took us more than an hour to first climb down all the way to the nullah bed and then to climb up to the cliff site where we were supposed to place the camera. I was still thinking if it would be worth the effort, but my doubts were more than allayed when I reached the place. Full of scrape marks and scats, this looked like an ideal place for fixing a camera. However this place harbored things that diverted my attention from camera traps and snow leopards. A blue sheep group on the move. The cliffs here in the upper half of the tall mountain overlooked the nullah flowing below with its crisp and clear water. The footing was not all that good and looking down I wondered, what a missed step or wrongly placed foot would mean. There was a small cave, with neat mud plaster slowly coming off the walls and inside the rocks were all black with what appeared like result of years of wood fire. There was a disfigured, but a beautiful painting of a Gompa (Monastery) that had been created by carving on the mud wall. I was very curious about it. Was it that this place was still being used by hunters, did people killed Ibex blue sheep and cooked them up in this desolate cave? I asked Tsering Dorje, my field assistant about this and soon the story unfolded. 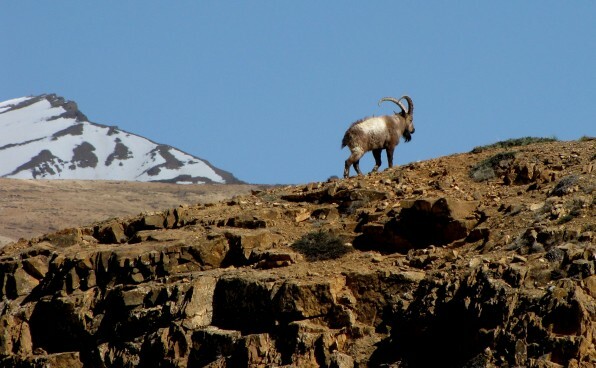 An Ibex male in its typical rugged habitat. There used to be a brave hunter who used to inhabit this cave, killing blue sheep and Ibex in the day and returning to his cave with the quarry in the night. Not very far from the place, there was a Buddhist monk, meditating in this serene and calm Himalayan environment. The hunter was very impressed with the austere life that the monk used to live. He made it a point to leave the best piece of the meat from his kills quietly at the doorsteps of the small cave that monk used to inhabit, making sure that he did not disturb the monk in his meditation. Spiti panorama. Buddhist monks still meditate in these remote mountains. It is said that years passed by like this when one day the hunter became a bit curious and decided to find out a bit more about the monk whom he had been selflessly serving for such a long time in his own small way. Once inside the cave, he was surprised to notice that none of his offerings to the monk had been accepted and that the monk turned out to be a staunch vegetarian. The hunter felt very bad about it. He thought he had sinned by placing chunks of meat and bone at the very door of a monk who in fact was a vegetarian. Thus filled with utmost remorse, he jumped off from the very cave where he had spent years placing meat at the door of the monk. It is believed that he did not fall in the nullah. Halfway through his decent, he was suddenly lifted up by some divine powers and he attained buddhatava (or nirvana in today’s more fancy terms). The monk had been watching all this. Thinking that if a sinner like the hunter who killed animal’s everyday and ate their flesh was lifted up by the divine powers, he was sure to be lifted too. Thus he jumped, full of confidence, just that no divine powers lifted him up. As per the latest rumours, a ghost has laid claim on this unclaimed property (caves). There indeed was an element of truth in these rumours as is evident from the photographs from our spy camera. 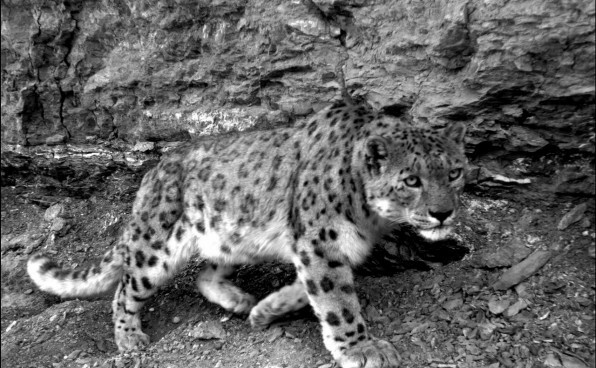 Snow leopard, the mountain ghost photographed by our hidden camera. The story had thus ended and all of us having had 2-3 cups of lukewarm tea from the big Chinese thermos were feeling refreshed and energized. It was time to move on to the next location of the day and may be search for another story. Lovely piece and images Rishi. I think its stories like these we can always meditate about. thanks for sharing! That was a nice read, and the photographs are fabulous! 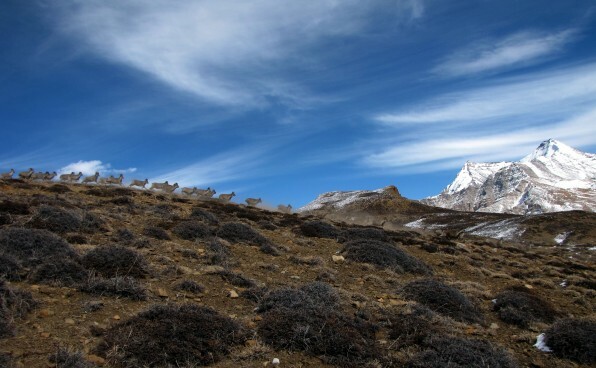 I particularly like the group of blue sheep and Spiti panaroma. what a picture to end the story with! 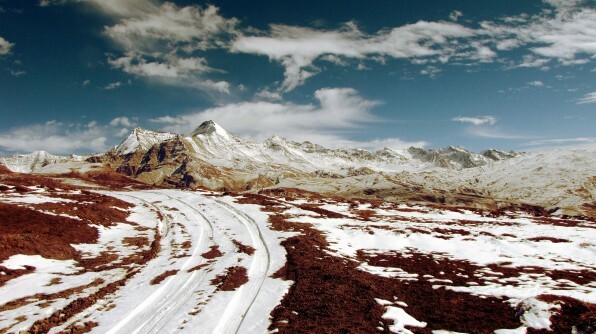 I am totally in love with these stories from Himachal/Spiti that I have been reading here. Pavithra Sankaran just told me about this blog and yours was the first post I read. It is a lovely piece of writing. Your story transported me. I look forward to reading more from you and the other bloggers here.